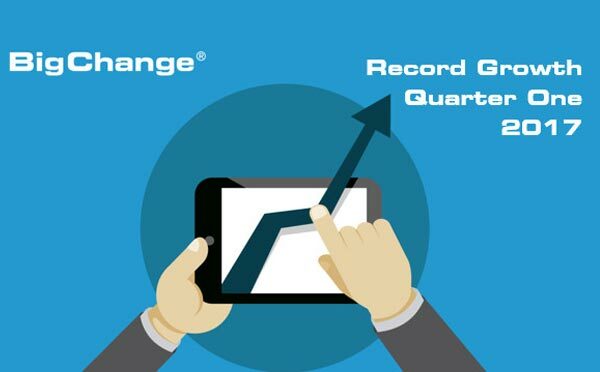 Leeds, UK, 7th April 2017 – BigChange powers ahead in quarter one 2017 with 100% sales growth and on track for annual turnover of over £7m. New orders in the period reached £2.7m pushing our subscriber base to over 12,000 across our customer base of 540 organisations. Four years ago, I founded BigChange with a vision to harness the benefits of a powerful, feature rich 3-in-1 Mobile Workforce Management platform that would be within reach of businesses of any size. We have combined back office CRM, Job Planning & Scheduling, a Rich Mobile App and Vehicle Tracking to help organisations go Paperless, making them more Efficient and Safer. As well as the UK, we have customers in Ireland, France, Spain, Finland, Norway, Australia and the USA. I owe a huge thanks to our customers who have worked with us along the journey. They are the catalyst of our rapid growth and have helped us shape our system. JobWatch has transformed productivity and profitability for our customers and is revolutionising the service experience for their own customers. During Quarter Two 2017 we will launch more applications and new features including workflow and process automation, collaboration between your company and your sub-contractor community (Job Sharing) and an on-demand service app; that our clients can deploy for their own customers. This will give every customer (no matter their size) the ability to have their own App in the iTunes or Google Play store for their customers (businesses or consumers) to book, track and manage their work in real-time with secure payment options. These developments are part of our vision to allow organisations to become even slicker and more efficient whilst improving the quality of service. I’d like to wish you good health and lots business success in the future.